This show may contain adult language. 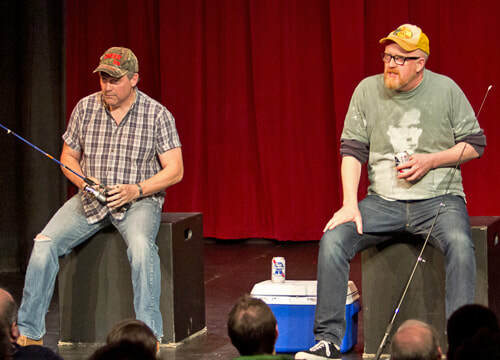 Donny and Earl sit in a 'boat' on stage, are fishing, drinking beer, and improvising stories based on several audience suggestions. They set up the audience with "good old boy" characters and then blow them away with intelligent debate, and often poignant insight into life in modern times. BASSPROV, currently based out of Chicago, has been performed in Theaters and Festivals all over the US and Canada, including the Del Close Marathon (at UCB in NYC), Chicago Improv Festival, Seattle Festival of Improvisation, Miami Improv Festival, Twin Cities Improv Festival, Dirty South Improv Festival, Denver Improv Festival, D.C. Comedy Fest, San Francisco Improv Festival, Philadelphia Improv Festival, Salt Lake City Improv Festival, Phoenix Improv Festival, Memphis Improv Festival, Toronto Improv Festival and Improv Boston, Bad Dog Theater (Toronto), Walden Theater (Louisville, KY), Dad's Garage Theater (Atlanta), Westport Playhouse (St. Louis) and St. Mary's (Halifax, NS). BASSPROV stars Joe Bill and Mark Sutton. This is BASSPROV's eighth visit to SFIT.